• Pedro Hernandez posted a 6.67 ERA with just 10 strikeouts in six starts since replacing Liam Hendriks in the rotation, predictably struggling versus lineups stacked with right-handed hitters. Hernandez, not unlike Brian Duensing, simply isn't capable of handling righties well enough to be a consistent starter. He struggled against righties in the minors and they've clobbered him in the majors, hitting .389 with a .704 slugging percentage and more walks than strikeouts. Hernandez may still have a big-league future as a reliever, but in the meantime he's headed back to Triple-A and the Twins called up an actual left-handed reliever, Caleb Thielbar, to replace him. That leaves the identity of Friday's starter against Detroit unknown for now, leading to speculation that it might be Kyle Gibson's debut. Gibson threw a complete-game shutout Sunday at Triple-A, his second in his last three starts, and Friday would be his normal turn for Rochester. Gibson turned in a clunker between the shutouts and his overall Triple-A numbers are good rather than great with a 3.25 ERA and 46-to-14 strikeout-to-walk ratio in 53 innings. If he doesn't get the nod Friday the other options are Rochester rotation-mates and short-term fixes P.J. Walters and Samuel Deduno, so presumably the choice comes down to whether the Twins believe Gibson is ready to stick in the majors yet. UPDATE: Deduno will get the start Friday. • As for Thielbar, he's a helluva story. Originally drafted by the Brewers out of South Dakota State in 2009, the Minnesota native got released before advancing past Single-A and latched on with the independent league St. Paul Saints. Thielbar had a 2.54 ERA and 62-to-15 strikeout-to-walk ratio in 50 innings for the Saints in 2011, which impressed the Twins enough to sign him. He started out at Single-A and has been at Triple-A since the middle of last season. Thielbar had a 3.64 ERA and 66/24 K/BB ratio in 67 total innings at Triple-A, which isn't great for a 26-year-old reliever, but he's been unhittable for the past month and the Twins decided to give him a shot. He throws in the low-90s and has enough raw stuff to survive as a middle reliever, but based on Thielbar's track record too many walks and fly balls could get him in trouble. Assuming the Twins demote a reliever to make room for Friday's starter his stay this time may be brief. • Chris Parmelee has regularly been benched in favor of Ryan Doumit since Oswaldo Arcia's arrival created a first base/corner outfield/designated hitter logjam, frequently sitting even against right-handed pitching. Parmelee's main problem is that he hasn't hit since a big September call-up in 2011, batting .219/.285/.352 with an 86-to-24 strikeout-to-walk ratio in 100 games, but he's also hurt by everyone competing for playing time being a left-handed hitter or switch-hitter. And that hurts the Twins too, because Parmelee and Doumit aren't starting-caliber hitters against left-handed pitching and Arcia could certainly use the occasional day off versus tough southpaws. But because the Twins lack a decent right-handed hitter to sub for them what happens is that one of the lefty bats sits versus right-handers when they should start and two of the lefty/switch bats start versus left-handers when they should sit. All of which brings me to Chris Colabello. Colabello is a 29-year-old non-prospect signed out of an independent league and wasn't all that impressive at Double-A in 2012, hitting .284/.358/.470. He moved up to Triple-A this season and has hit .361/.419/.657 with 12 homers in 45 games. Being stretched defensively anywhere but first base hurts Colabello's cause, but he's a right-handed hitter and would seemingly be more useful to the Twins than Parmelee given their current roster construction. UPDATE: That was quick. Colabello has been called up to replace Trevor Plouffe, who was put on the seven-day disabled list with post-concussion symptoms. 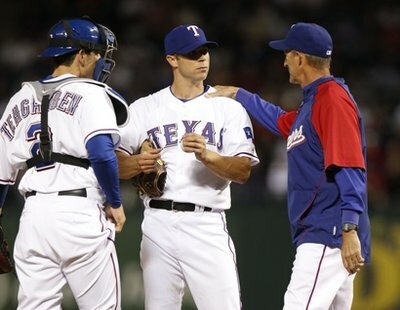 • At the most basic level a team's best relievers should throw the most relief innings, but because of how most managers' bullpen usage revolves around the save statistic that often isn't the case. Instead, when a setup man becomes a closer his workload almost always decreases and closers frequently throw fewer innings than middle relievers because they're constantly being held back for "save situations" that may never actually arrive. Perkins missed a couple days with a sore left side, so if not for the injury he might have one more appearance, but the point remains. In terms of appearances Perkins' workload is closer to the long man (Anthony Swarzak) and Rule 5 pick (Ryan Pressly) than to the most-used relievers in the bullpen. And in terms of innings Perkins is the least-used reliever in the entire bullpen. How does that make sense? If you're not obsessed with the save statistic, it doesn't. Pitcher X is Nick Blackburn, about whom the same type of things were once said to explain his initial success despite terrible strikeout rates. Now, in fairness the above comparison is way too simplistic--Diamond gets more ground balls than Blackburn, to name one key difference--but you get the idea. Diamond is walking a very thin line right now as he tries to duplicate his unexpected 2012 success and avoid going further down the Blackburn path. 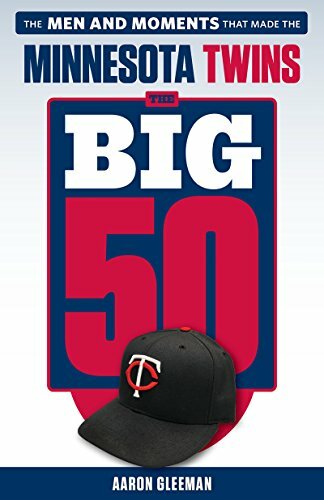 • After two injury wrecked seasons the Twins have been remarkably healthy so far, but their lone significant injury has provided a glimpse into the same question marks that filled 2011 and 2012. Darin Mastroianni injured his ankle late in spring training, but instead of simply placing him on the disabled list to begin the season the Twins kept him on the active roster. He was too limited to actually do much, but they used him as a pinch-runner and defensive replacement. Then, after appearing in eight games without logging a single plate appearance, the Twins deemed Mastroianni healthy enough to start two games in center field. Shortly after that he was placed on the DL and diagnosed with a stress reaction in his ankle. Initially the Twins said he'd be out three weeks, but that came and went with Mastroianni still in a walking boot and now he's expected to miss the rest of the first half following surgery. I'm no doctor, but that's an awfully familiar story. • Rafael Perez, who signed a minor-league deal with the Twins in February, was released from Triple-A after failing to impress coming back from shoulder surgery. At the time of the signing the Twins indicated that Perez was close to being full strength and they planned to stretch him out as a starter, but within weeks he'd been shut down. Perez pushed back his May 1 opt-out clause to give the Twins more time to evaluate him, but after four appearances they'd seen enough. • Rich Harden, like Perez, signed a minor-league deal with the Twins coming back from shoulder surgery and, like Perez, it hasn't gone well. Harden hasn't been released yet because his opt-out clause isn't until July 31, but he's yet to appear in a game and assistant general manager Rob Antony revealed that his progress is going "slow" and "not very well to be honest." Harden has been hurt for basically his entire career, so he was always a long shot. • There are eight American League starting pitchers with an opponents' batting average of .310 or higher and four of them (Vance Worley, Mike Pelfrey, Diamond, Hernandez) are Twins. Kevin Correia avoids that list, but his .292 mark isn't exactly pretty and in his last four starts he has a total of seven strikeouts and five homers allowed. • Twins pitchers have allowed an MLB-high 47 runs in the first inning through 41 games. They've allowed 25 or fewer runs in every other inning. And since that will make everyone curious: Brad Radke had a 5.05 ERA in the first inning and a 4.07 ERA in all other innings. 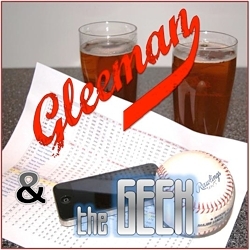 • For a whole lot more about Gibson and Colabello, plus a bunch of other Twins topics, check out this week's "Gleeman and The Geek" episode. • Parker Hageman of Twins Daily interviewed Twins manager of major league administration and baseball research Jack Goin for a glimpse into the team's use of statistical analysis. Hageman co-hosted this week's "Gleeman and The Geek" episode and we discussed that topic quite a bit. Short version? While it's nice to see the Twins get more involved in statistical analysis my sense remains that they're merely dipping their toes in the water while other teams are swimming. • Rene Tosoni, who the Twins dropped from the 40-man roster in August, has signed with the Brewers on a minor-league contract. Tosoni cracked my annual ranking of Twins prospects at No. 11 in 2010 and No. 14 in 2011, but he was sidetracked by injuries and then basically just stopped hitting. Now he's a 26-year-old corner outfielder who struggled in 60 games for the Twins in 2011 and hit just .224/.293/.315 in 81 games between Double-A and Triple-A last season. • Clete Thomas, who briefly filled a bench spot while the Twins kept Ben Revere at Triple-A for a bit longer, has re-signed on a minor-league deal. Thomas struck out 16 times in 28 at-bats for the Twins and hit just .232/.281/.405 with a 109-to-22 strikeout-to-walk ratio in 109 games at Triple-A, so despite his big-league experience the 29-year-old outfielder now looks like little more than depth for Rochester. • After appearing on "Gleeman and The Geek" two weeks ago Darren Wolfson of 1500ESPN.com did some digging and found that Rich Harden's minor-league contract with the Twins includes a July 31 opt-out clause. As far as opt-out clauses go that's a very late one, so if he doesn't look to be at full strength in spring training the Twins can stash Harden at Triple-A for a while and that makes what was already a worthwhile, low-risk flier look even better. • Free agent Brett Myers was linked to the Twins by various sources throughout December, but ended up signing a one-year, $7 million deal with the Indians that includes an $8 million team option for 2014. And according to Wolfson the Twins never even made him an offer, which has become a familiar story this offseason and makes Kevin Correia's two-year, $10 million deal all the more confusing. • And speaking of the Indians, they're the latest mid-market team to secure a new local television deal that significantly surpasses the Twins' current contract with FOX Sports North. • Adam Rubin covers the Mets for ESPN New York and had an interesting little note related to the Twins, reporting that they would have taken Jefry Marte from the Mets with the No. 4 pick in the Rule 5 draft had Ryan Pressly of the Red Sox not been available. Marte is a 21-year-old third baseman who hit just .251/.322/.366 at Double-A last season and was not selected by another team, with the Mets later trading him to the A's for Collin Cowgill. • Billy Bullock, the 2009 second-round pick traded to the Braves for the ability to stash Scott Diamond at Triple-A as a Rule 5 pick, was suspended 50 games for a "drug of abuse." He still throws hard with lots of strikeouts, but Bullock's control is awful and he's no longer a prospect at age 24. I hated that trade at the time and it's worked out very well for the Twins, although I still think they should have just kept Diamond as a long reliever and kept Bullock. • On a related note, Diamond underwent minor elbow surgery to remove a bone chip and should be ready for spring training, but he won't pitch for Canada in the World Baseball Classic. • In looking over Mike Pelfrey's career it struck me how amazing his draft class ended up being. Pelfrey was the No. 9 pick out of Wichita State and among the players selected ahead of him were Justin Upton, Alex Gordon, Ryan Braun, Troy Tulowitzki, and Ryan Zimmerman. But wait, there's more. Other top-30 picks included Andrew McCutchen, Jay Bruce, Cameron Maybin, Jacoby Ellsbury, Colby Rasmus, and Matt Garza, who the Twins took No. 25. That's crazy. • Jeff Clement was the No. 3 pick in that same draft--between Gordon and Zimmerman--and after hitting just .218/.277/.371 in 152 games for the Mariners and Pirates he'll likely spend this season at Triple-A for the Twins. 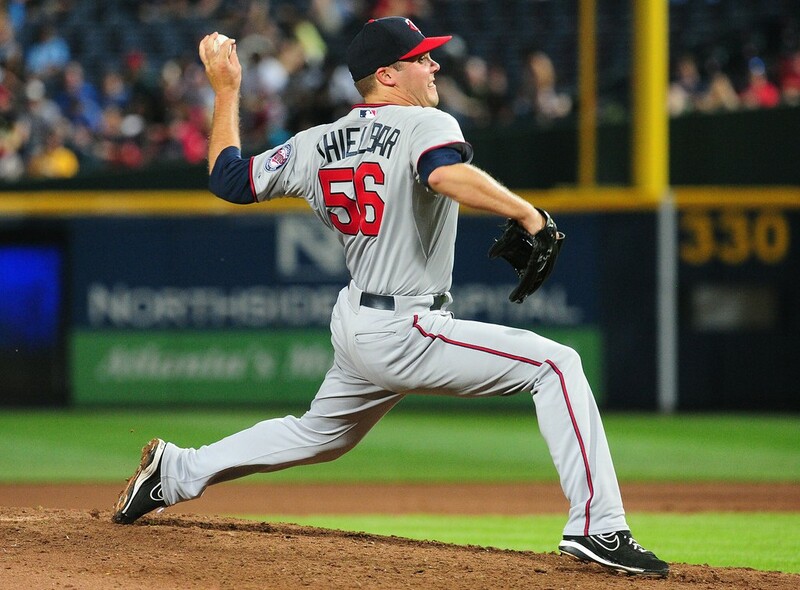 • After spending nearly all of last season in the Twins' bullpen despite adding to his lengthy track record of mediocrity with a 5.71 ERA and 26-to-22 strikeout-to-walk ratio in 52 innings Jeff Gray was dropped from the 40-man roster in late August. He went unclaimed on waivers, became a free agent, and agreed to a minor-league deal with the White Sox. • Kiley McDaniel, who formerly worked for several MLB teams, recently watched Miguel Sano and Byron Buxton play instructional league games and wrote very detailed, interesting scouting reports for Fan Graphs. • Francisco Liriano's two-year, $12.75 million deal with the Pirates is in jeopardy because of an offseason injury to his non-throwing arm. • An oral history of Nick Punto sliding into first base is the best thing you'll read today. • Podcast listeners who enjoy when we're interrupted by a drunk person will absolutely love this week's episode, and there's also some good Twins talk about how the roster is shaping up. 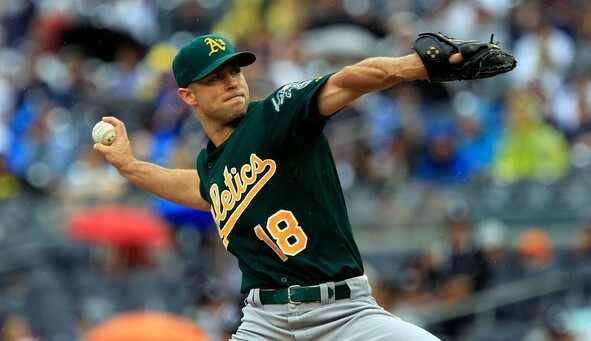 Rich Harden was once among the best young pitchers in baseball, debuting with the A's as a 21-year-old and throwing 360 innings with a 3.60 ERA and .232 opponents' batting average through age 23. He missed lots of bats with a mid-90s fastball, hard slider, and devastating splitter, and many people viewed Harden as having the most upside on Oakland staffs that included Tim Hudson, Barry Zito, Mark Mulder, and Dan Haren. And then the injuries hit. Harden was sidelined by everything from back spasms and hip strains to oblique pulls and finger blisters, but his first big injury was a sprained elbow ligament and most of his career has been spent trying to pitch with major shoulder problems. He threw 190 innings as a 22-year-old in 2004, but hasn't reached 150 innings in a season since and failed to throw 100 innings in five of the past seven seasons. That includes 2012, when Harden missed the entire season following January shoulder surgery to repair a torn rotator cuff. Last month Harden announced plans to make a comeback and Friday he agreed to a minor-league contract with the Twins, getting an invitation to spring training but not a 40-man roster spot. At age 31 he's an intriguing flier to take and the complete lack of risk makes it a worthwhile pickup for the Twins, but expectations should be held in check. For many years Harden was somehow able to maintain overpowering raw stuff and strong results despite the never-ending injuries, but that has long since ceased being true. He's basically lost one mile per hour on his fastball every two years, going from 94 mph in 2004/2005 to 91 mph in 2010/2011, and his slider lost similar velocity. And left with diminished raw stuff, Harden posted a 5.36 ERA with 93 walks and 35 homers allowed in 175 innings between 2010 and 2011. Last winter Harden indicated that he'd been pitching through significant shoulder pain for years in an effort to skip surgery, but finally decided he couldn't continue to sacrifice his velocity just to avoid going under the knife. Because of that there's some hope his raw stuff will return, at least somewhat, and it's worth noting that even while struggling overall in 2010 and 2011 he did manage 8.6 strikeouts per nine innings while starting 33 games in the AL. In fact, during that two-year stretch in which opponents hit .261 with a .476 slugging percentage off Harden he ranked 15th in strikeout rate and 22nd in swings missed among the 159 starters with at least 150 innings. He was done in by horrible control and way too many homers, but if given another mile or two per hour to work with it's not inconceivable to think Harden could cut down on some of the mistakes while keeping the missed bats and be effective again. Of course, that would involve successfully coming back from major shoulder surgery and then remaining healthy, the former of which is far from a sure thing and the latter of which has been a career-long struggle. I've often wondered why teams have never tried to keep Harden healthy by shifting him to the bullpen, where he could air it out for 15-20 pitches without worrying about in-game fatigue, and it sounds like the Twins are open-minded to a potential relief role. Last winter the Twins took a similar flier on another oft-injured righty, Joel Zumaya, who blew out his elbow in his first spring training game. Harden's injury history isn't quite as debilitatingly gruesome, but all the same caveats apply. There's a strong chance Harden will never pitch for the Twins, but there's also some chance he'll be a useful mid-rotation starter or setup man--even temporarily--and that's certainly worth a no-risk look. For a lot more about the Harden signing, check out this week's "Gleeman and The Geek" episode. Back in early December the Twins offered free agent Carl Pavano arbitration, which is basically a one-year contract for a salary to be determined later. Pavano eventually accepted the offer and later the two sides avoided a hearing by agreeing to a one-year, $7 million contract, but had he declined arbitration I'm told by a very reliable source that the Twins were preparing to make a serious run at free agent Rich Harden. Harden ended up signing with the Rangers about 48 hours after Pavano accepted arbitration, getting a one-year, $6.5 million deal that includes another $3.5 million in potential incentives and an $11 million mutual option or $1 million buyout for 2011. Even considering his lengthy injury history I was surprised that Harden could manage only $7.5 million in guaranteed money and that proved to be a mere $500,000 more than Pavano officially signed for a month later. I liked the Twins' decision to offer Pavano arbitration and thought $7 million was a worthwhile investment for a veteran pitcher who, despite a massive injury history of his own, was durable in 2009 and projected to be a solid middle-of-the-rotation starter if healthy in 2010. However, there was little doubt that Harden possessed far more upside than Pavano, at least in terms of what each pitcher was capable of if fully healthy and working with their peak stuff. Among all pitchers with at least 25 starts Harden had baseball's highest strikeout rate in each of the past two seasons, joining back-to-back NL Cy Young winner Tim Lincecum as the only starters with more than 10 strikeouts per nine innings in both years. During that two-season span he had a 3.05 ERA with 352 strikeouts in 289 innings while holding opponents to a .208 batting average. When healthy enough to take the mound few pitchers were as dominant. Pavano has never been that type of pitcher and certainly wasn't going to approach that type of dominance at age 34, and while he logged 199 innings without missing a start last season he actually threw fewer innings than Harden in 2008, 2007, 2006, and 2005. In other words, if Pavano was more of a sure thing than Harden for 2010 it probably wasn't by much and Harden possessed significantly higher upside. Or so it seemed, at least. Pavano began this season with back-to-back Quality Starts before turning in a clunker Sunday versus the Royals, making him 2-1 with a 4.96 ERA through three turns in the rotation. Harden actually has a 4.73 ERA through his first three starts, but that's misleading. He has one Quality Start and in fact has made it out of the fourth inning just once, lasting 3.2 innings against both the Blue Jays and Yankees with a solid outing versus the Indians sandwiched in between. Now, don't get me wrong: I'm not suggesting that three April starts mean much of anything in terms of whether the Twins would be better off with Pavano or Harden. However, what does mean something is that Harden has looked terrible--or at least like nothing resembling his old self--in all three outings. He has 14 walks in 13 innings--for comparison, Pavano has a total of 17 walks in 90 innings since joining the Twins--and his velocity is way down from years past. Harden's average fastball has dropped from 94.4 miles per hour in 2004/2005 and 93.6 mph in 2006/2007 to 92.1 mph in 2008/2009 and barely above 90 mph this season, so all the injuries may have finally caught up to him. In terms of the rotation I'm told Harden was the Twins' first or second offseason target alongside Pavano, so while Orlando Hudson, Jim Thome, and J.J. Hardy stand out as strong additions a move they didn't make may work out just as well. Francisco Liriano was fantastic again last night, following up seven shutout innings last week against Boston with eight scoreless frames against Cleveland. In those 15 innings he got 14 strikeouts versus four walks while inducing 23 ground-ball outs, which along with significantly increased velocity is creeping ever closer to 2006 territory. Best of all the back-to-back gems aren't the extent of his reemergence, as Liriano also dominated winter ball and spring training. Liriano looks like a top-of-the-rotation stud again, the offense leads the AL in walks and ranks second in runs per game while grinding out tough at-bat after tough at-bat, and for the first time in franchise history the Twins have won five straight series to begin a season. There are some injuries to worry about and playing time issues to sort through, but the Twins are firing on nearly all cylinders right now and the division doesn't look capable of keeping pace for long.